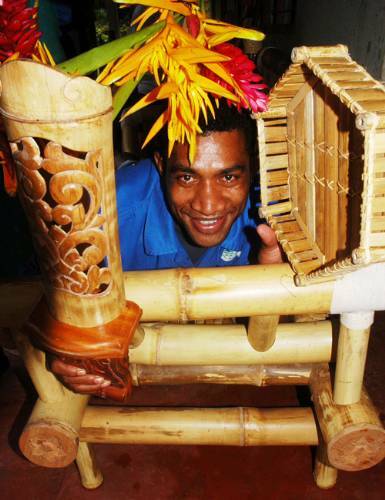 FOURTEEN young men from a Taievu village are learning the art of designing and making furniture out of local bamboo. The Indonesian Embassy, which organised the workshop, is impressed with the quality of local bamboo and is helping a local businessman Usaia Korodrau look for markets locally, for the products. The workshop started in November last year after Mr Korodrau approached the Ministry of Forests and the Indonesian Embassy with the idea of using bamboo to make furniture. "In 2000, I went to China to attend a workshop on how to design and use bamboo and last year the Indonesian Embassy facilitated a workshop where I learnt the art of creating designs and the actual manufacture of the items," he said. The Embassy's Second Secretary, Robert Sitorus said according to experts from Indonesia, Fijian bamboo was of the strongest quality and furniture made from it would be durable. He said the workshop participants, aged 19-25, were looking at blending designs from Indonesia and Fiji. Mr Korodrau said the youths worked with him at the workshop at his home in Vusuya Village, Nausori. "These youths were unemployed but they have a lot of talent for the work and after attending the workshop by the Indonesian Embassy, their talents have been enhanced," he said. Items made by the team include trays, sofa sets, coffee tables, a double bed, chairs, lamp shades, baskets and mirror holders. Mr Korodrau said he hoped to get the products into the market by the end of April. He said once the products were launched in the market, he would be able to employ the youths.